Nuclear Throne is a broken game. Not the Early Access version: that's coming along nicely. Rather, the secret series of just-for-YouTube builds that Vlambeer developer Rami Ismail spent a night creating for YouTube person STAR_. The escalating absurdity starts with excessive screenshake, and ends with... well just watch to find out. Nuclear Throne is a top-down shooter roguelike in which mutants must make their way through a post-apocalyptic world. 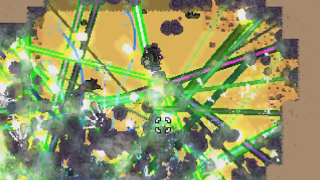 Vlambeer recently handed out free giftable copies to all existing owners. Which was nice.